You can place your order here, online, with the security of PayPal®. Even if you don’t have a PayPal® account, you can still place your order securely with your credit card. You can also fill out your order here, online, then print it out and mail it in along with your payment. Or if you’d prefer, you can download an order form, print it out, fill it in, and mail it in along with your payment. All Shipping & Handling charges for the Continental U.S. are automatically calculated in the Shopping Cart. If you'd like to place an order to be shipped outside the Continental U.S., please contact us. 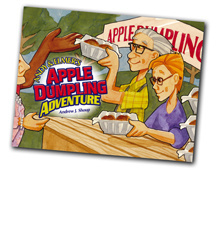 This Picture Book is a sequel to Andy & Elmer’s Apple Dumpling Adventure. It is beautifully illustrated and, in addition to the story, there is information about Rotary and a special Apple Cinnamon Pinwheel Cookie Recipe in the back. The recipe can be a fun project with parents or a classroom project involving skills in reading, math, following directions, and teamwork. Summary: Becky and Lin become partners in an effort to bring something new to the neighborhood. Demonstrating the idea of Service Above Self, they take on a major community project. And, inspired by their example, others in the community come together and contribute to their efforts to create something wonderful and beneficial for everyone. CLICK ON YOUR QUANTITY BELOW. Watch the Promotional Video to See It in Action! NOTE: This edition is being phased out. This Hardbound Picture Book is beautifully illustrated and, in addition to the story, there is information about Rotary and a special Apple Dumpling Recipe in the back. The recipe can actually become a fun project with parents or, as some schools have done, can become a classroom project involving skills in reading, math, following directions, and teamwork. 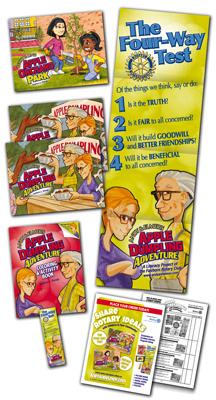 Some schools have gone even further by selling apple dumplings as a fund-raiser. Summary: What starts out as a simple baking project quickly turns into an exciting business venture for Andy and Elmer. Demonstrating The Four-Way Test, a mysterious voice provides guidance for Andy, as he learns the value of truth, fairness, goodwill, friendship and that which is beneficial to all concerned. This Paperback Picture Book is identical to the hardbound edition, with the exception of the hardbound case. It is priced a bit lower and, therefore, may better suit certain needs. It is beautifully illustrated and, in addition to the story, there is information about Rotary and a special Apple Dumpling Recipe in the back. The recipe can actually become a fun project with parents or, as some schools have done, can become a classroom project involving skills in reading, math, following directions, and teamwork. 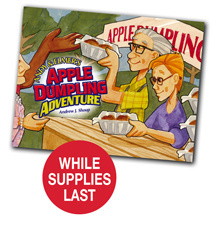 Some schools have gone even further by selling apple dumplings as a fund-raiser. 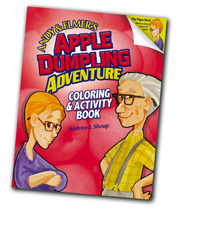 This Coloring & Activity Book contains pretty much the same story as the Picture Book, although it has been somewhat abbreviated to fit the coloring book format. 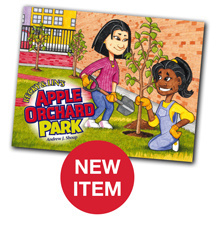 In addition to the coloring pages and story, there are several activities in the back of the book, including a crossword puzzle, word search, and drawing exercise. It also contains information about Rotary. It works great in conjunction with the A&E Hardbound Picture Book or as a follow-up to it. But it can also stand alone. 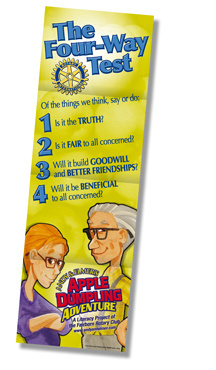 This Four-Way Test Bookmark is a fun, colorful piece which conveys the Four-Way Test and includes characters from the story. Many clubs that are currently involved in the Dictionary Project will utilize the A&E Bookmark by simply putting one into each dictionary as they hand them out to children. This Four-Way Test Poster is a fun, colorful piece which conveys the Four-Way Test and includes characters from the story. Perfect for the classroom, library, or even a child's bedroom.